Police departments across the state of Indiana will now have the opportunity to receive mental health training that will save lives and help people living with mental illnesses get treatment. 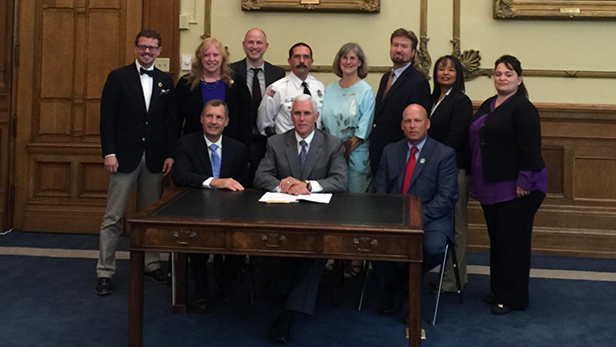 On June 18, Indiana Governor Mike Pence will sign the unanimously passed Senate Enrolled Act 380, creating the Indiana Technical Assistance Center for Crisis Intervention Teams (CIT). Jun. 25, 2015 Back row - from left to right Kimble Richardson, Marianne Halbert, Joshua Sprunger, Lt. Anthony Maze, Marilynn Berry-Stamm, Stephen McCaffrey, Barbara Thompson, Stephanie Quiring. The successes of CIT led state legislators to realize the value of CIT. The technical assistance center will help accelerate what NAMI affiliates and mental health advocates in Indiana have been working on for over a decade. Halbert is currently working with Indiana’s Criminal Justice Institute and the state’s Division of Mental Health and Addiction to begin the process of forming the technical assistance center. Approximately 300,000 people in Indiana have a serious mental illness, and police officers often become first responders when someone is experiencing a psychiatric crisis. These encounters often lead to arrests when treatment would be more appropriate. CIT is a pre-arrest diversion that gets people into treatment and helps cut down on the number of low-level offenders in jails and prisons. Most of Indiana’s larger cities have already implemented CIT. With SEA380, the Indiana Technical Assistance Center for Crisis Intervention Teams will help bring the lifesaving training to rural areas of the state where it is often difficult for law enforcement to afford additional training. The center will help counties identify local resources and grant funding to shoulder the expense. CIT brings together police, mental health providers and advocates to form a team of people ready to respond to a psychiatric crisis. CIT trained officers learn to recognize the signs and symptoms of a mental health crisis and how to use verbal de-escalation to safely get a person to help. Police departments team up with hospitals and other mental health providers to get treatment for the person having a psychiatric crisis. CIT is already working in Indiana. The Fort Wayne Police Department implemented CIT more than a decade ago. In 2014, the FWPD reports that CIT officers responded to 1,518 psychiatric crisis calls. A mental health provider treated 98% of those cases, there were only 4 arrests. SEA380 received bi-partisan support with nine authoring senators; Sen. Mark Stoops, Sen. Michael Crider, Sen. James Merritt, Sen. R Michael Young, Sen. Carlin Yoder, Sen. Lonnie Randolph, Sen. James Arnold, Sen. Patricia Miller, Sen. Ron Alting, and five sponsoring representatives; Rep. Harold Slager, Rep. Linda Lawson, Rep. Dan Forestal, Rep. Dennis Zent, Rep. Martin Carbaugh.